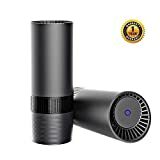 Top 10 Best Air Purifiers in India 2019 - Top 10 In India - Only The Best of everything! LATEST product list, updates regularly! "According to a survey 35% of India's children suffer from lung related ailments and nearly 50% of Delhi's kids have pollution related respiratory and lung problems"
Cut it out and take me to the Top 10 Best Air Purifiers in India, my child is inhaling toxic air right now! Let me tell you the experience of a colleague. This family recently bought an air purifier by Tefal, that they got at a good price on Amazon.in, and installed it in their children's bedroom. Their younger son who is nine years old suffers from childhood asthma, and due to the heightened pollution levels he has been having breathing trouble for several days. To the extent that they had to take him to the hospital for nebulisation two times. The first thing that they noticed on putting on the air purifier which has a pretty good capacity, is that the indicator showed red, which means very high level of pollutants the air. They kept the air purifier on for the whole day, and after several hours slowly the indicator started to turn blue, meaning low pollutants levels in the air. The room was kept closed and the children stayed inside the room most of the time. They used it all day and all night for the next few days, and one of the first things that it resulted in was that their younger son's breathing problems disappeared. This was a very clear indication that the air purifier was working well. This has made all of us at Top 10 in India realise that air purifiers do work, as long as we buy a good brand with HEPA filters and good CADR capacity. If you are worried about the pollution levels in cities like Delhi, and other polluted cities in India, we suggest that you invest an an air purifier quickly. Just have a look at the Top 10 Best Air Purifiers in India from the list below, and pick the one that fits your budget and fulfills the important requirements as listed in this guide. There is something very transparent about a Top 10 bestselling list that cannot be doubted. It is a list of products that has been bought the most. 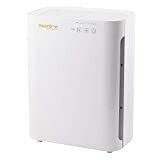 In the case if air purifiers, this list which features on this page features the best air purifiers at the best prices. There is no opinion here or basis on reviews or experiences. These air purifiers have been bought in the highest numbers in India. That means they have good quality and are reliable. It is good to read reviews, but starting from the list of best air purifiers is also a great way to find a good air purifier. Read the reviews of a few air purifiers on the list and then make an informed choice backed by actual numbers. In this list of Top 10 Best air purifiers in India, you will only find the latest models as the list is updated every day. You will find a variety of air purifiers because different people have different budgets, but within the category, it is these air purifiers that are selling again and again. 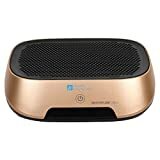 A top 10 best air Purifier is the equivalent of a hit or a bestseller, and you will find the very best in www.top10in.in. When you pick an air purifier from the Top 10 Best air purifiers in India you are making a good choice. With pollution levels worsening everywhere, it is a good idea to invest in an air purifier, especially if there are children in the house or some family members are prone to respiratory ailments. Bad air is the cause of many diseases, and is the primary cause of most respiratory diseases and asthma in children. If you live in a metro, it is even more important to take steps to fight the bad effects of air pollution. An air filter is effective in removing pollutants from the air inside your house, and it will reduce the bad effects of air pollution. Though it cannot be claimed that an air filter will completely eliminate the bad effects of air pollution, it is a good ideas to have one, especially if there are children in the house. Before you buy an air filter certain points need to be kept in mind, so that you get the best results and are able to effectively reduce the bad effects of air pollution. The air filter you buy should have a HEPA filter. HEPA stands for High Efficiency Particulate Air, and HEPA filters are essential to remove the small particulate matter which is PM 2.5 or less. These small pollutant particles that are in the air end up going deep within one’s lungs and is the cause of most respiratory ailments. When you look at the specifications of the air filter, ensure that it says that it features a HEPA filter. NOTE – Some air filters claim to have a HEPA-like filter, these are not the HEPA filters and will not remove the small particulate matter in the air that causes the maximum harm. All air purifiers have a specification known as Clean Air Delivery Rate or CADR. It is a measure of the quantity of air it can clean in a specified time. The higher the CADR, the more air the purifier can clean. When choosing an air purifier, look at the CADR of the different models and choose one that has a high value for CADR. The general thumb rule for CADR is that it should be more than two thirds of the volume of the room it needs to clean. So a 120 sq. ft. room should have a CADR of at least 2/3 of that or at least 80. Here is a simple chart which you can use to calculate how much CADR is required for your room. Some Air Purifiers come with their room cleaning capacity specified, but they are for ideal conditions. Therefore it is recommended that you take that value and halve it to get a realistic idea of what size room it will clean effectively. A pre-filter does the job of removing the larger particles in the air, so that they do not need to be cleaned by the HEPA. The main advantage is that, if the pre-filter removes the bigger particles than the HEP filter does not need to remove these, and efficiency and its life is much better. The pre-filter is very easy to clean and replace, which significantly increases the life-span of the air purifier. 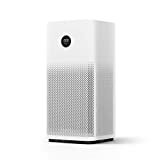 We recommend that you go in for an air-purifier that has a pre-filter, it will make the air cleaning better and make the air purifier last longer. The Heavy Activated Charcoal does the job of removing harmful gases and bad odors. When the air purifier has Heavy Activated Charcoal, it is far more effective. You can easily check for the presence of Heavy Activated Charcoal in the specifications of your air filter. Try to stay away from air purifiers with Ozone creating specifications like negative ions, photocatalytic oxidation, UV lights etc. Some components in some models of air purifiers have Ozone creating components and specifications. If the air purifier you are looking at has negative ions, photocatalytic oxidation, UV lights, then avoid it, as these components can release Ozone, which is harmful for our lungs. Ozone is known to cause asthma and respiratory problems. If you follow these tips, you will find the right air purifier for your home. You can start your search for the best air purifier by checking out the top 10 best air purifiers in India. Pick one from these bestselling air purifiers and rest assured that you are getting a value for money and high performance air purifier for your home. When you choose from the Top 10 in India, you get the perfect balance of quality, value and reliability. Go ahead, choose an Air Purifier that the world trusts. Coway is No.1 Brand in the world for Air Purifiers. | Coway Products are 100% made in Korea; Air Purifier Type- Sleek Professional Air Purifier; Air Purifying Method: True HEPA Technology. | Reddot Design Award Winner. Coverage Area: 355 sq. ft / 33 sq. mtrs. 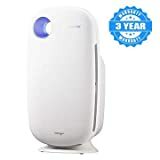 (Most Suitable for Large Bedroom, Kitchen, Drawing Room) | Clean Air Delivery Rate (CADR): 303 cubic m/hr (CADR is Volume of purified air produced in an hour) | Sleek & Intuitive Design. | Super Silent Operation. | Auto Mode: Automatically optimizes Air Quality using specialized dust sensors. Unique 3 Stage Filtration Process- Pre Filter, Patented Urethane Carbon Filter (To Deodorize the air- 98% Efficiency), Our Multi Layered True HEPA Filter effectively traps PM2.5 particles allowing only clean air to pass through | Optimized Airflow: innovative flow path design allows for a slimmer design with more efficient & maximum airflow. | One Touch Speed Adjustment: Four Speed Steps (1-3, Turbo) | Real Time Air Quality Indicator: Clean, Low Pollution, Medium Pollution, High Pollution. Manufacturer warranty only applicable on products sold by seller "Dyson India". No other seller offers manufacturer warranty from brand Dyson in India. Intelligent Purification; Automatically removes 99.95% of allergens & pollutants as small as PM 0.1 (0.1 microns) including dust, pollen, mold spores, bacteria, pet dander, VOCs and other harmful gases/odors. Engineered to project and circulate purified air across LARGE spaces. Dual functionality with fan feature along with air purification. 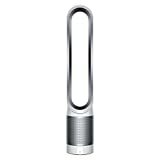 Dyson purifiers have a lower face velocity unlike some other conventional purifiers. This, along with the high-efficiency VACUUM SEALED 360° Glass HEPA FIlter ensures that harmful ultra-fine pollutants are NOT released back into the room & stay captured in the filter media. The most polluted places in a city are the roads, and in a congested city, we are all spending many hours on the road every day. When you are driving, even if the air conditioner is on, pollutants seep inside the car. That is where a car air purifier can prove to be very useful. Did you know that the pollution on the roads inside a car can be five times higher than normal? If you are commuting to work every day, and if your children are traveling by car to their schools or to other places on a regular basis, we feel you can buy a car air purifier and keep the inside of the car free of harmful pollutants. The basic principles of choosing a car air purifier remain the same as a room air purifier. They should have HEPA filters. Their CADR capacity should be according to the size of your car. The car air purifier should be easy to connect to a car power socket. The power cord should be long enough so that you can place the air purifier anywhere in the car. It should have activated carbon. Top 10 Best Car Air Purifiers - Click to open full gallery! Click to open full gallery! Did you know that an average Indian spends almost 24 hours in a car in a week, where the air quality can be 5 times worse than outside? Presenting Move Pure Car Air Purifier by Honeywell, a Fortune 100 company. High Grade HEPA filter - removes PM2.5, dust and fights external particulate pollutants. Advance double layer active carbon filter - removes VOCs, formaldehyde, cigarette smoke, bacteria, virus, toxic gases and odour. Completely ozone free, does not release any ions. PORTABILITY : Suitable not only for cars but also for many small areas such as Desktops. The compact size(2.6*2.6*7.1 inch) makes it a perfect fit for car cup holder. INTELLIGENT MODE FUNCTION: Pre Built Intelligent mode automatically varies the speed of the air purifiers as per the air quality. This product comes with 1 year of Warranty. 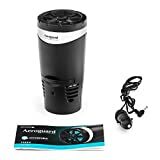 FOR PURE AND HEALTHY AIR: ANSIO's Portable Air Purifier helps to reduce Vehicle exhaust, Smoke, Dust, Allergens, Total Volatile Organic Compounds, Formaldehyde, Odours etc thereby providing a pure, safe and healthy breathing space. 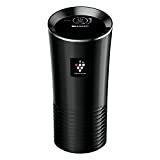 The portable air purifier is equipped with an USB Charger Output and is quite compact for easy portability. FEATURES AROMA PAD AND SMART MODE OPERATION: After the 6- Stage air purification process, the filtered air comes in contact with the Aroma Pad. The Aroma pad further enhances the quality of air by imparting the fragrance of the essential oil put on it. To suit your preference the air purifier can be operated in a High Speed, Low Speed or Smart Mode. The smart mode operation automatically detects the air quality and adjusts the operating speed of the air purifier in accordance with it. PRODUCT SPECIFICATIONS: Dimensions: 212 x 136 x 66 mm, Voltage: 12 V, Power: 9W, UV Light Lamp Life: 20,000 hours, Negative Ion Density: 3 million per cc, Coverage: 150 square feet. The filter can last approximately for 3 to 6 months depending on the usage and air quality..
Refreshes your car air with natural fragrance (Jasmine flavour complimentary) and filter replacement indication / Automatic switch on/off button /3 fan speed modes and perfect in-car integration with installation in cup-holder and compact and stylish design made for high end cars. Provides purification against - PM2.5/PM10, Smoke, Virus, Bacteria, Odour, Gases / TOC, Formaldehyde, Pet Dander etc.